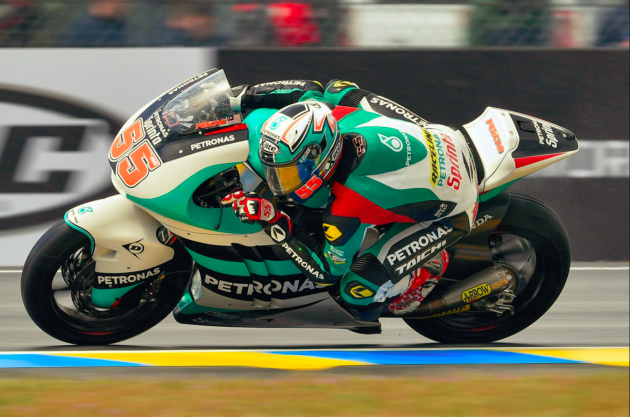 After an earlier report that Malaysian racer Hafizh Syahrin, also known as “Pescao 55” to fans, was on a short-list of possible replacements for German Jonas Folger in MotoGP, a report has emerged that the matter has been settled. A MotoGP.com report says that satellite team Monster Yamaha Tech3 has chosen Hafizh out of a few candidates. Folger had to pull out of the 2018 MotoGP season due to injury, and Tech3 were considering several replacements, including Hafizh. Team principal Herve Poncharal said earlier that nothing had been decided as there were different priorities to consider, but MotoGP.com has reported that Hafizh will be testing in Buriram, Thailand, riding a Yamaha YZR-M1, on February 16. 23-year old Hafizh will be team mates with 2016 Moto2 champion Johann Zarco, who himself has shown potential since joining Tech3. Hafizh has been competing in motorcycle Grand Prix since 2013, stepping up to the podium twice in 2017, at Misano and Motegi. Meanwhile, Hafizh’s slot in SIC Racing Team will be taken by Zulfahmi Khairuddin, who steps up to Moto2 from the Supersport World Championship, where he raced a Kawasaki ZX-6R with orelac Racing.. 26-year old Zukfahmi will have his first Moto2 test at the Circuit Ricardo Tormo in Valencia, Spain, on February 6. The post Zulfahmi enters Moto2 with SIC Racing Team, Hafizh to ride for Yamaha Tech 3 in MotoGP for 2018 appeared first on Paul Tan’s Automotive News.